Here are some suggestions on how best support a disappointed student, and how to cope if you are that student. 1: Try to remain calm. Breathe , ground yourself, practice mindfulness (lots of videos online to help), talk to a supportive person. The next few days are going to continue to be fraught if your child (sorry to all 17/18/19 year old students for using the word ‘child’ -!!) is waiting on a CAO place. 2: Avoid the drama with family and friends and neighbours. 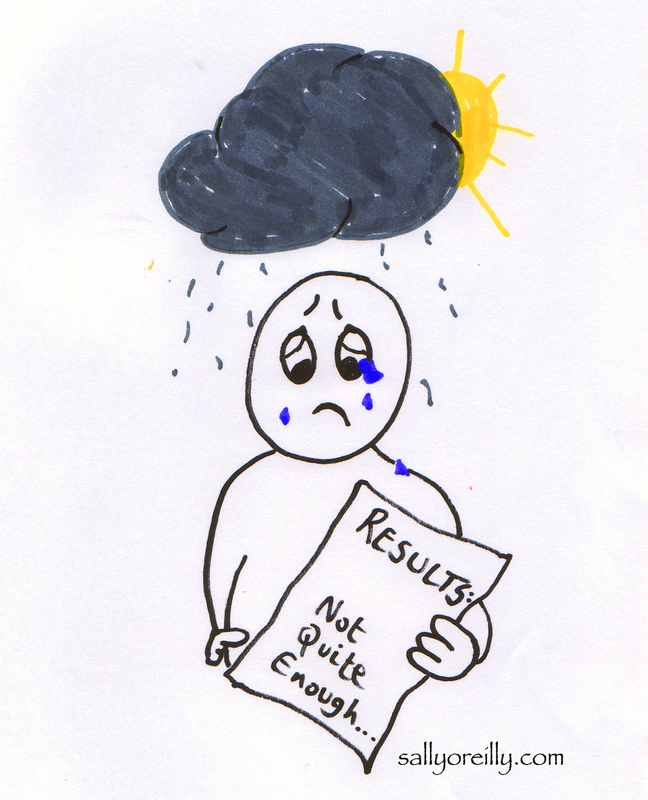 Your child’s results are their business and they may feel exposed or shamed if you discuss the results and the disappointment with everyone. Do your best to allow the student to control who hears about their results and how they hear. 3: Try not to fast forward – We can make reasonable assumptions about third level based on past CAO points, but we cannot assume. This is a process, you now have an indicator, not a final answer. Have a plan to fill the time between now and CAO day – make sure it involves distraction and fun! 4: Remember – this is about your child, not you. You will of course feel their disappointment, that’s natural. You will be disappointed for them, not “in” them. What they will need to hear is the word “for”, what they might hear is “in”. Communicate this to them clearly so that they feel supported rather than judged. 5: Try to avoid rushing in with solutions. The initial shock and disappointment will be experienced like a grief, and will need to be treated as such. If you know why they didn’t do well, now is absolutely not the time for “told-you-so”s. They’ll know that themselves and are probably already beating themselves up about it. Allow time for the grief to hit and then space will come free for solutions. 6: Allow for the fact that your child may turn to their peers for support more than to you, at least initially. This is normal, they’ve shared a very stressful year together, 9am-4pm, every day. It’s not personal, and so while it’s hard not to take it personally, I appreciate that, it really is OK and not a reflection on you or your parenting abilities. Quite the contrary – you’ve successfully taught them to seek support where they need it – a life skill that will stand to them forever! 7: I know that many families choose to leave for a break during this time. Particularly if they are waiting on CAO placements. I applaud this idea! Be aware that there may be more online chat than usual happening though while you’re away – it may not be the intimate family time you dream of! Perhaps consider staying local and allowing your son/daughter to have friends around more than usual during this stressful and possibly lonely time. Contact with peers is crucial for them at this time – especially if they are about to take different paths in life. Disappointment is real and you will need time to recover. Enlist the help of friends who have experienced similar let downs career wise and who have managed to reframe their experience. Now is a great time to source resilient role models! Google alternative courses, post-leaving-cert courses, new courses, direct entry courses, courses abroad, “backdoor courses”. These are options that you may not yet have considered, but they are there, and they are valid options, even if they’re not what you originally wanted. Remember this: Almost half of school leavers (47%) would not choose the same post-school pathway if they could choose again either completely or ‘to some extent’. Talk to a career guidance counsellor – either the one(s) attached to your school or one of the many private Guidance Counsellors if you are in a position to pay for the service. Script check. You are entitled to check your exam scripts – if you believe there was an error or that you deserved a better mark it is worth using this service. Remember that there are second round offers. If you are completely confused and feel stuck, consider looking for and taking a job for a year, even if it’s not in your ideal sphere. You may need time out. A job, the responsibility that goes with it, the wages, the colleagues – all of these things can boost our confidence and may indeed mean that this time next year you are in a much better and more empowered position that now to make choices. Getting plenty of sleep and exercise always helps us deal with stress better. Avoid drugs and alcohol. Seriously. It’s tempting I know. But consider the fact that alcohol is a depressant and drugs won’t solve your actual dilemma. Have an honest look at why your results were poor – this will stand to you whether you end up in college, if you repeat or if you decide to go straight to work. The trick is to acknowledge the things that you are/were responsible for, and resolve to do them differently the next time you are faced with a similar challenge. That might mean spending less time on Facebook, Instagram or gaming. But it will be worth it. Always think of the payoff for future you, and the fact that you have choices. Exceptions: There are of course some things that are beyond your control, for which you were not responsible. Know the difference between the two lists! Death of a family member, a friend or neighbour, a teacher, or anyone you feel close to or admire. Family discord or abusive family situations. These are worth acknowledging but not self-blaming. Beating yourself up over these won’t be helpful to you, and it will feel horrible. You don’t deserve to feel horrible… Please get as much support as you can if any of these are ongoing, especially if you continue to live under difficult circumstances. Keep talking about how you feel to someone you trust who isn’t dramatic (!!). If you don’t know anyone personally, please feel OK about contacting a professional person, a counsellor, a guidance counsellor, a psychotherapist or a psychologist. It’s why we’re here! Believe that you will get through this, it may not be as originally planned, but you will find a solution. < We’re all gone Mango Mad!